Zubin Mehta (born 29 April 1936) is an Indian conductor of Western classical music. He is the music director of the Israel Philharmonic Orchestra (IPO). Mehta was Music Director of the Montreal Symphony Orchestra from 1961 to 1967, and Music Director of the Los Angeles Philharmonic Orchestra from 1962 to 1978, being the youngest music director ever for any major North American orchestra. In 1969, he was appointed Music Adviser to the Israel Philharmonic Orchestra and in 1981 Mehta became its permanent Music Director for Life. In 2016, Mehta has been appointed as Honorary Conductor of the Teatro San Carlo, Naples. In December 2016, the Israel Philharmonic announced that Mehta is to retire from his permanent position as music director in October 2019. In September 2006 the Kennedy Center announced Mehta as one of the recipients of that year's Kennedy Center Honors, presented on 2 December 2006 by President George W. Bush. ↑ "La Repubblica, 13 April 2015". Retrieved 7 May 2016. ↑ "Zubin Mehta announces retirement from Israel Philharmonic". Jerusalem Post. 2016-12-26. Retrieved 2017-11-06. ↑ "Padma Awards". Ministry of Communications and Information Technology). Retrieved 16 May 2009. 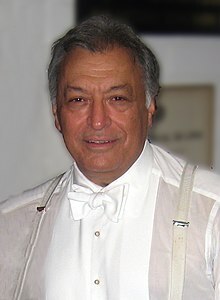 Wikimedia Commons has media related to Zubin Mehta. This page was last changed on 30 December 2017, at 06:58.